it's the element inside the building that has yet to be built. The entire piece of flat track drops and lines up with a new piece directly under. This then means the train will "back out" of the building and go backwards down a hill and onto the course. I was just kidding about the black track. That element sounds really interesting. Will it be almost like Expedition Everest with the bi-directional travel? I wonder exactly how this Intamin innovation will work? No POV animation available yet I guess. I went yesterday and got a good look at it. The backwards element is there and it is a helex. It looks like the indoor section includes an elevator which takes you to different levels of the building, i say this because there is a huge whole in the ground with no track in it and on another level track with no end so maybe that all links up. i would think it more likely that the pit at the bottom is for all the machinery associated with making the track drop. ie train drops from 1 down down to 2, level three is machinery. Maybe some sort of ride show or special effects. Maybe it drops down to level 3 and rises up to level 2 to drop off the trains. ^ I think that's what being suggested. Sounds unlikely though as it would create a very long block and probably hinder capacity (especially with what appear to be smaller Intamin trains. Do the plans not show the track layout inside the building? EDIT: Could i not just be maintenance? That's a great present for AT. An e-mail was sent to those on the SW6 mailing list from PR agency "Frank PR". Although not giving details away regarding the ride's world's first element, it does announce the arrival of the ride's unique selling point/element on site yesterday. The release also contained pictures of the load arriving, covered in a large branded tarpaulin on a flatbed truck. A video has also been released on Facebook featuring footage of the truck arriving on site. There is no mention whether any of the above rumours have any truth in them. 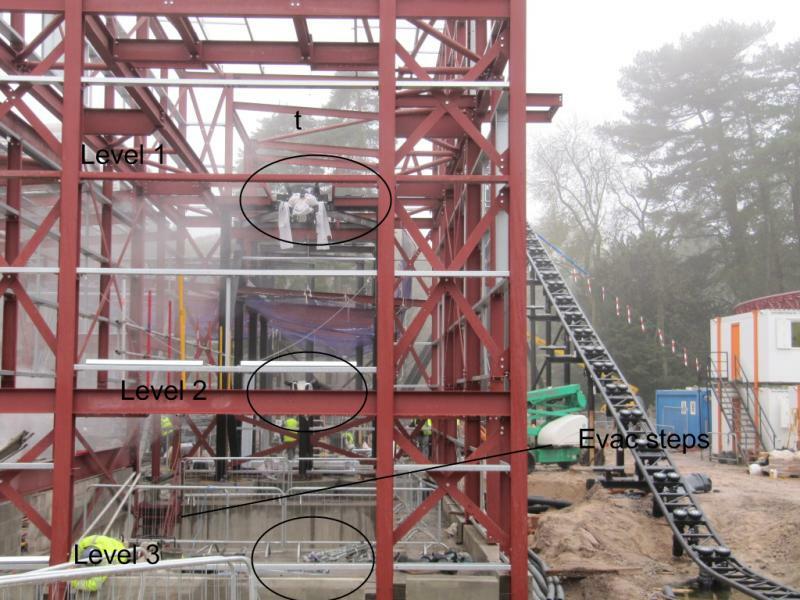 Also discussed, is the steps the park have taken in ensuring the ride remains "top secret". This apparently includes increased security staff, a banning of any cameras and mobiles phones, requiring staff to sign non-disclosure agreements and also approaching Google Earth to black out aerial views of the building site.